This past Remembrance Day I was at Don Heights Unitarian Congregation in Toronto to speak about the armistice of 1918 and commemoration. I arrived feeling grateful for the opportunity to share my thoughts on the centennial of that moment in time, and was surprised to immediately encounter the congregation’s exhibit of items from the era of the First World War. 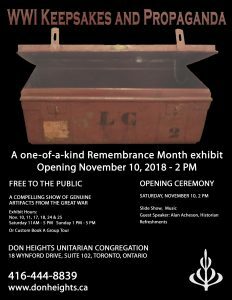 The congregation held an opening ceremony for the displays the day before I visited, and the WWI Keepsakes and Propaganda exhibit received attention from a number of media outlets, including CBC, CTV, Toronto.com. As the news reports and poster included here reveal, the exhibit is open to the public. I spent some time viewing the displays after my talk and was impressed by the quality and engaging historical content of the material. Some of the material is from a trunk discovered in an attic, full of publications a French teacher collected and used in her classes. Another part of the exhibit is from a family collection of items from First World War veterans, one of whom is William Andrew White, an important figure in the Canadian history of anti-racism who served in Canada’s segregated No. 2 Construction Battalion. My talk outlined the First World War’s legacy of war remembrance, casting its symbols, forms, and ceremonies as collective responses to loss on an unprecedented scale. I touched on change and conflict in war commemoration since 1918, and the selectivity of war remembrance. In the conclusion, I hoped to encourage my audience to consider what meanings they would like emphasized on the Remembrance Days to come, and whether there are symbols and approaches that could be added to the traditions developed since the end of the First World War. The video of the talk embedded here does not include the discussion afterwards, which followed-up on some of the issues I raised, and brought up new ones. One audience member drew on his career in public education to comment on changes in the ways local schools recognized Remembrance Day. Several others suggested an interest in reconciling remembrance of war service and loss with the significance of peace. In this collective discussion, and in one-on-one conversations afterwards, I encountered a great variety of personal perspectives on past war and its current significance, reflecting, I think, diverse backgrounds, life experiences, and interests. The discussions, the service that brought people together that day, and the exhibit, all demonstrated Don Heights’ interest in engaging with the past and debating its meaning for the present. There are many examples of such interest during the long centennial of Canada’s First World War, a pattern that speaks to the particular legacies of the war in Canadian society. But while organizations of all sorts have mounted events and exhibits large and small since 2014, there has been considerable criticism of official commemoration of the First World War centennial, including Jonathan Weier’s piece for ActiveHistory.ca months before the centennial was underway. A recent example is a Macleans editorial that used the example of the Armistice18 project in Cobourg, Ontario to shame Ottawa for its lackluster commemoration efforts. The project combined theatrical productions, talks by historians, an art exhibit, and local historical walks, all focused on the First World War. The irony of Macleans’ criticism is that Armistice18 was supported by federal funds. Ottawa’s preferred approach to First World War commemoration and public history was to support projects initiated by various established and temporary organizations across the country. I think there are some good reasons for this approach, among them the fact that the depth of interest in the war’s history has encouraged so many different projects, large and small. Other reasons include the difficulty of justifying the funding of commemoration or historical interpretation over other priorities, especially on the heels of Canada150, and the not-so-distant War of 1812 bi-centennial. It would be natural for elected officials to be wary of courting more controversy about Canada’s past, too, given the debates that have raged about statues of historical figures, proposals for new monuments, and changing the name of book awards or schools. The current government has demonstrated a readiness to offer official apologies for past wrongs, however, most recently for Canada’s response to the St Louis refugees in 1939. Clearly this willingness to address the past did not extend to “going big” with First World War commemoration, and my guess is that the established tradition of war remembrance, with its familiar poppy, monuments, and moment of silence, already offered itself as a format for recognizing the centennial. There is debate about elements of this tradition, as Andrea Eidinger’s piece on the poppy recently showed. I wonder as we move further away from Canada’s two experiences of mass war whether there will be more debate about the use of the poppy, and if its centrality for commemoration will decline or be further challenged by other symbols. It does seem likely that we will see an ongoing diversification in memorial efforts about the war. The Pontian Memorial unveiled in Toronto in 1999, that I wrote about back in 2014, represents a different community of memory than the mainstream one that supported civic cenotaphs and community memorials in the 1920s and 1930s. The monument unveiled in Parry Sound in 2016 to Anishinabe soldier and Wausasking First Nation community leader Francis Peghamagabow is another such example. These, and doubtless many others, are now part of a century-long tradition of First World War commemoration, in which community-based groups of various kinds have featured so prominently.